I can honestly say that Tiagra on this bike is really not bad at all. Mine shifts great! (Better than my road bike sometimes.) Although, I think I miss that last gear (my road bike's a 10-speed). This is a great bike--very beefy, very fun! 9-speed is still a more versatile system than 10 due to the compatibility with mountain bike rear derailleurs and cassette cogs. We can get up to 34 tooth cogs on the rear of Cross Checks in 9 speed. Going to 10 limits that low gear to about a 27 or 28 tooth cog. Well, I wasn't complaining! ;) The "missing last gear" is probably more psychological than anything. I can still get the Surly up Snowville Road to ride to work, so all is good. The Cross-Check is a great--and very comfortable--commuter bike. Tiagra components have come a long way. Very close to 105, I hear. Nice Salsa bars, too. Can't wait to own a graaaaaaaaavy brown one! It'll hide all that mud I'll be splashing on it. 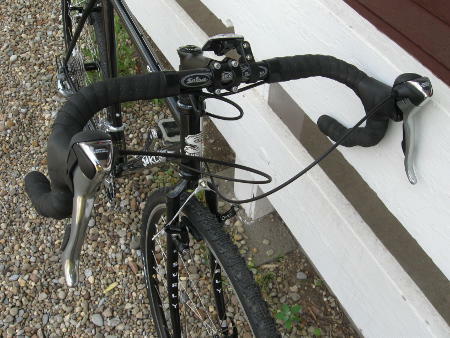 I purchased a Cross Check this spring a hated the Bar End Shifters. 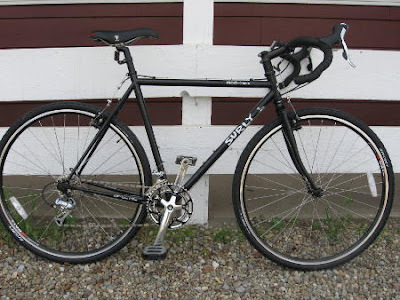 Didn't want the Pacer because I needed a multipurpose bike and perfer cantilever brakes, since they are really easy to adjust and cheap to replace. Found this post and ordered the Tiagra 4501 STI Shifters right away. Cross Check is a truly nice bike with the proper modifications.